. please read full ad . No more time wasters thanks and picture collectors. Only black and tan females remain.and the parents are small standard daschsunds. Update pupps have received first full vaccine and been given thumbs up off vet. I have for sale a stunning litter of dachsund puppies. These outstanding pups were born on 17.2.18 and raised in my family home with no expence spared. The pups shall be ready to leave for their new homes after the 14th April. 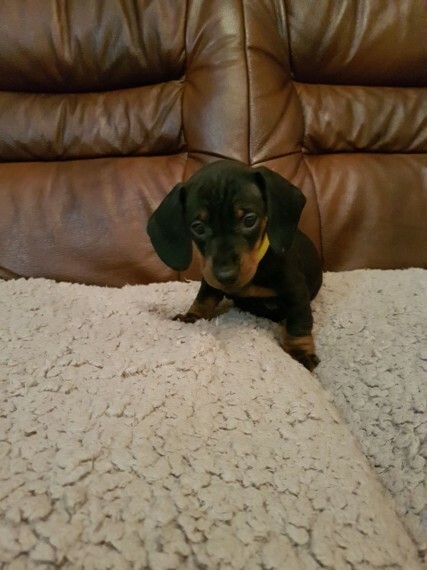 We have a litter of black and tans and silver dapples consisting of 5 female and 2 males. Mum is a lovely chocolate dapple and dad is a handsome blue tan. Pups have been wormed from 2 weeks of age. Pups will not be KC reg so pet homes only. We have 2 dapple females. 3 black and tan females. 2 black and tan males..2 Reserved. Dapple girls are 1000 each.. 2 dappled girls reserved. Black and tan girls 800 each. Pups will leave us with their first full vaccination. microchip along with their vet check. Also an information pack on the breed. A supply of food which that have been weaned and a scent blanket. Pups have been well socialized with children and adult of all ages and handled daily. They are use to the hustle and bustle of everyday life. These super pups have got a fantastic temprement and love a cuddle on the sofa and a play with teddy bears. If you would like any more info on these puppies feel free to call.text.email. or whattsapp. A non refundable deposit of 100 will secure pup of choice. Thanks for reading.